GRAPHIC VIDEO: Police are looking for a suspect who robbed an elderly Florida woman of her purse and then proceeded to run her over with a vehicle when she confronted him. An elderly Florida woman was hospitalized after a purse-snatcher ran her over with an SUV in a disturbing robbery caught on video. 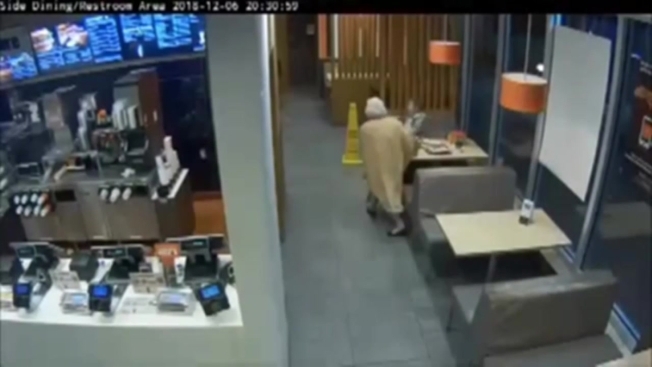 Security footage from inside a McDonald's restaurant in Okeechobee shows a man in a white baseball cap and a maroon shirt approach the seated woman from behind. The man reaches over her right shoulder to grab her Coach purse, NBC 2 News reports. He then sprints out of the door and into a waiting car. The woman chased after the man. Security footage of the Thursday incident from the parking lot shows that the woman opens the driver-side door of the vehicle, but the man backs up – knocking her down, dragging her and running her over in the process. Police later said they arrested Charles Alton Stratton Jr. in the case, according to WPTV.